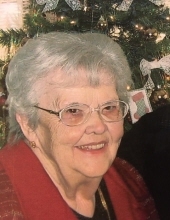 Patricia Ann “Pat” Lawson 91 New Castle resident passed Monday March 25, 2019. She was born March 18, 1928 in New Castle IN a daughter of the late Patrick Earl and Mary Alice Clinton Todd. 2 sons Bruce (Shirley) Smith of New Castle, Joey (Sue) Lawson of Decatur ILL.
Grandchildren. Dean (Laurie) Ballenger of Noblesville, Tabatha (Adam) Thompson of Lewisville, Travis Edwards of Decatur ILL, Missy Smith of New Castle, Derek Lawson of Decatur ILL, Summer Dawn Lawson of Decatur IL and 19 great grandchildren, 7 great-great grandchildren. 1 sister Mary Alice Mark of New Castle and several nieces and nephews and cousins. 2 daughters Connie Smith Stanley and Karen Lawson. Grandsons Bruce P. Smith, Anthony Ballenger and Bruce P. Smith Jr.
Funeral service will be held 4pm Saturday March 30,2019 Macer-Hall Funeral and Cremation Services. Family and friends may call from 2-4pm Saturday March 30, 2019 at Macer-Hall Funeral and Cremation Services. Burial at a later date in South Mound Cemetery. Online condolences can be made to www.macerhall.com .Macer Hall funeral directors are honored to serve the family of Pat Lawson. To send flowers or a remembrance gift to the family of Patricia “Pat” Ann Lawson, please visit our Tribute Store. "Email Address" would like to share the life celebration of Patricia “Pat” Ann Lawson. Click on the "link" to go to share a favorite memory or leave a condolence message for the family.